I bought this 1923 seaside view several years ago in a small, second-hand book shop in the Cornish fishing village of Mousehole. Little did I imagine when doing some research on the Internet to discover whether the Cary Hotel still existed, that I'd stumble upon a fascinating tale of murder and that this picturesque view is, in fact, a Victorian crime scene! 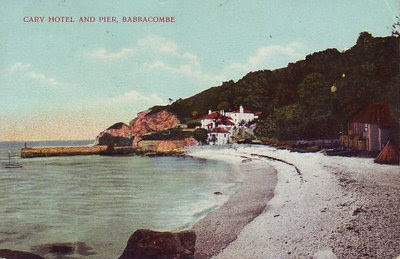 The image is that of Babbacombe Bay, looking towards the hotel which in the 1880s was known as The Cary Arms, as seen from neighbouring Oddicombe. However, it is the building with the steeply sloping roof, that can be seen on the right, which excites the greatest curiosity. On Saturday 15th November 1884, an elderly spinster by the name of Emma Keyse, was found hacked to death in that burnt out villa (known in those days as The Glen). Her murderer, John Lee, was convicted and sentenced to death but in the strangest twists of fate, when the day of his execution came, three attempts to hang him failed and his sentence was commuted to life imprisonment. Certainly, from the message on the reverse of this postcard, the holiday makers who sent the card on 2 July, 1923 seem oblivious to Babbacombe's past notoriety! Read more about John 'Babbacombe' Lee aka The Man They Couldn't Hang at Ian Waugh's fascinating website here.